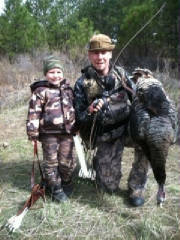 Here his Joel Turner and his son with a nice turkey he took with his A&H longbow and his Abowyer broadheads. Nice turkey but even better memories! Nice work guys! Dan Palma with a great looking turkey. Here is Doug with with a great shot on a Florida Turkey, using an Abowyer 130gr broadhead.